Advance Your Fourth Edition Game! 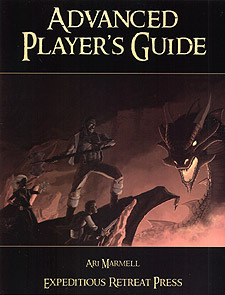 The Advanced Player's Guide contains 3 new races, 5 new classes, 10 new paragon paths and over 300 new powers. Harking back to the heydays of yore, yet with a solid footing in the present game, this book provides you rules for savage warriors, nature priests, martial artists, troubadours, and spellbinders. Also contained herein are craft rules for making objects along with a system of lingering wounds to advance your game to the next level. Call the storms and stir the rage within!